The classical labyrinth, sometimes called Cretan labyrinth, has a small center. It is normally as largely as the ways width. By many in the labyrinth movement a labyrinth with a large center was always wished, especially for walkable labyrinths. Because there a bigger group can meet in the center. Some years ago I was faced with this task. And exactly at this time my attention was caught by an article in Jeff Sawards periodical Caerdroia No. 33 from the year 2003, in which of such a labyrinth was reported. The photo in the article was from a German archeologist, who participated in excavations on Knidos. 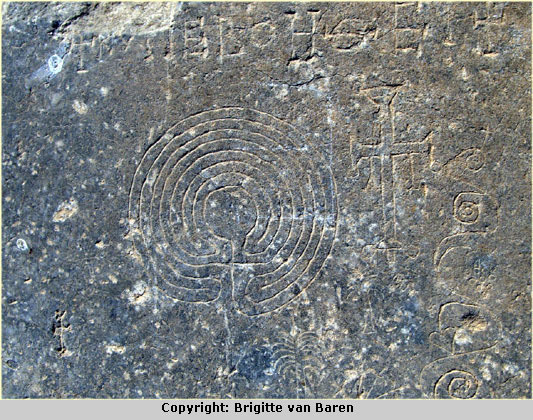 But I am proud that meanwhile I received photos from a Dutch woman, Brigitte van Baren, who was sailing in the Aegaean Sea and visited Knidos herself after having seen the Knidos labyrinth at the Benediktushof at Holzkirchen (Germany). Knidos is a peninsula in the southwest of today’s Turkey with a rich antique inheritance. Only a few years ago a labyrinth inscription was found on a block of black marble in the ruins of the Roman city. Except the circular center the labyrinth has the seven paths of the classical type with the central cross. 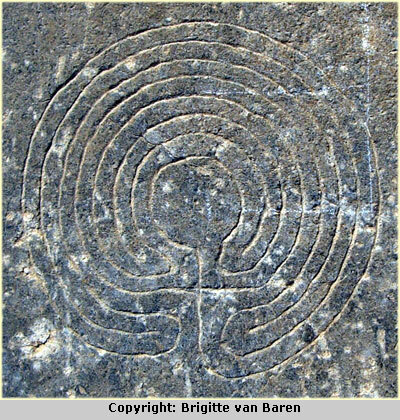 Above the labyrinth is an inscription in Greek: KYRIE BOETHIE (Lord help). The other carvings on the block, such as the Christian cross, palm trees, fruits, the letters Alpha and Omega allow to date the labyrinth to the 6th and 7th centuries AC. The size of the labyrinth can be estimated to measure about 21 cm. A small hole in the circular center of the labyrinth indicates that it was constructed with the help of an engraving tool. The central cross of the well-known basic pattern is good to recognize. There is thus a historical labyrinth with a large center, which is at least 1300 years old. That’s very interesting! As you say, Knidos has got a very rich past. Actually the peninsula where Knidos is (Datca Peninsula, sometimes referred as Resadiye), is a real beauty! But not sure why people of Knidos made this labyrinth and the ‘Lord Help’ sounds quite meaningful considering the shape of the labyrinth!